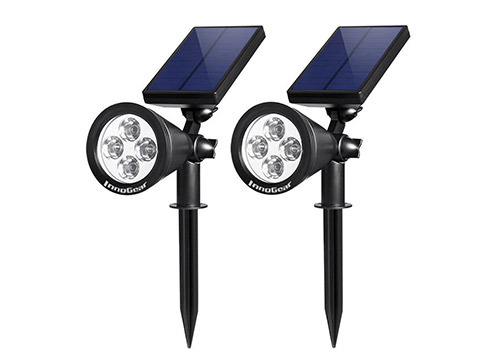 Enjoy the many benefits that come with solar garden lights. They make use of a solar lamp, popularly known as a solar lantern. It is a lighting system that comprises a solar panel, battery, a LED lamp, a charge controller and probably an inverter. The lamp will operate on battery electricity produced by a charge from the solar photovoltaic panel. Solar cells, with the photovoltaic panel, are fully capable of taking up direct sunlight and convert it to direct current. The solar system will then work towards transferring the energy into the battery and finally to the garden lights. 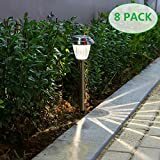 The lights are ideal for garden, home paths, and even street lighting. 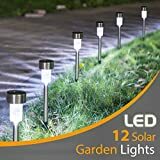 The following is a list of some of the best solar garden lights available in the market in the coming year . 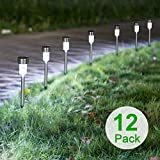 Voona lights are best for decorating your garden and home paths. Although the initial purchase cost is high, they will eventually save you money in form of electricity periodic bills. The LED bulbs do not require replacing in the Voona light lifetime, saving costs on bulb replacement issues. The lights are made to be environmentally friendly and can work under any weather conditions. The lights will give an elegant and concise illumination by giving 6lumens output using sun pattern light. 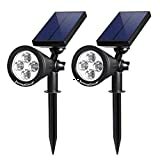 These are 2-in-1 solar lights for outdoor landscape’s lighting, auto on/off lighting for home driveways or pool lighting. This latest series of the InnoGear lights features a lengthened stick that gets inserted deeper into the ground. It is always stable even during bad weathers such as windy, snowy or rainy conditions. It also has an enhanced brightness of up to 200 lumens from the previous 80 lumens, brought about by the enlarged solar panel and energy capacity. The lights are made of ABS material to be heatproof and waterproof. 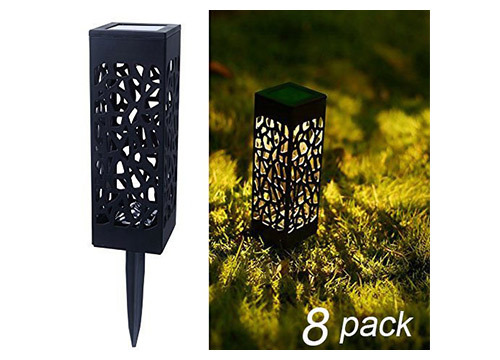 These solar pathway lights are ideal for your flower beds and other extra dark blocks with their extra dressy looks. They are also good for adding flavor to your house front instead of doing costly electricity wirings. The high-quality lights are designed with a good quality plastic material, are explosion proof and cause no overheating. The solar panel placed at the top of the lights recharges the battery during the day using sunlight. They automatically turn on during night time and stay that way all night through. 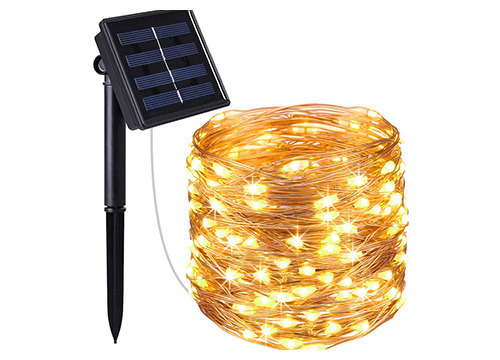 Amir lights are powered by solar and consist of starry string lights, indoor and outdoor waterproof solar-decorated lights used for gardens, dancing, home and party decorative ornaments. 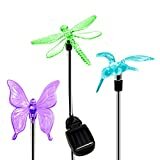 They are fed by a 100 LED and durable copper wire. The 33 feet miniature warm and white LEDs enables you to make your deck, patio, front porch, kitchen, and living rooms very beautiful. It features a warm white light color and solar powered. The Boomile lights work by a LED lamp being charged by the sunlight for a duration of 4-6 hours, to provide a 6-8 hours lighting. 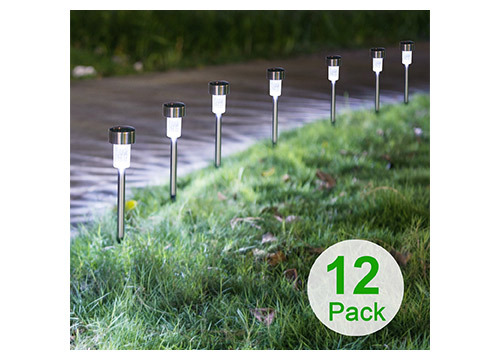 The lights are weather resistant and get no damaging effect when exposed to snow or rain. They have a weather rating of IP44 and have weatherproof high-quality material. 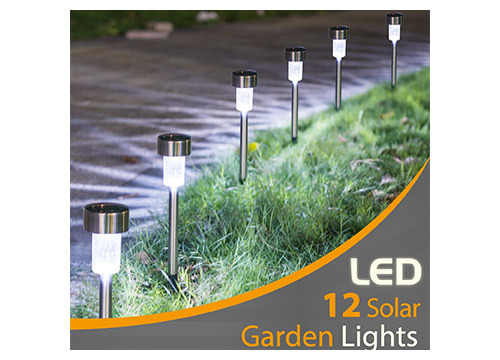 Solar Garden Lights are ideal for outdoors such as the porch, garden, patio decoration, and pathways. They are easy to install by just removing the isolator tab found under the cab and pushing the stake deep into the soil. The lights will automatically turn on and off at night and dawn respectfully. 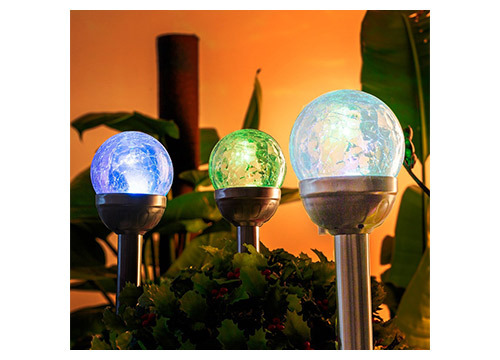 It is a unique designed-globe solar light that makes the night quite enjoyable. It is designed with a gradual and color changing mode, creating a dreamy and romantic atmosphere. The single white color-mode also provides very good lighting effect that makes the surrounding very comfortable. 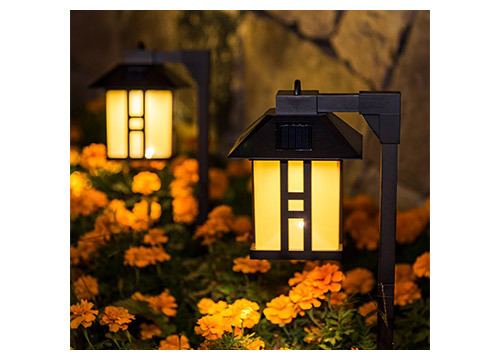 It is a perfect light for your balcony, outdoor decorations, patio, front/backyard, pathway and the garden. The light is waterproof and with no overheating. 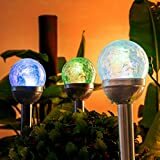 The solar light will have a magical lighting effect, with its warm and bright lighting provided to your sidewalk, patio, or the garden. The hollow designed lights give out a fantastic lighting during the night, creating a lasting memory about the lighting for your outdoor quarters. It has 2 lumens and a decoration type of design, without a lot of brightness, but warm and gentle. The light is powered by solar energy from the sun. It is weather resistant, withstanding rain, frost, and snow. It is very easy to install the solar light. 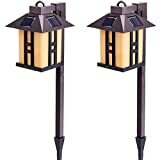 The solar light is ideal for outdoor lightings such as garden, pathway, landscape and lawn lights. The silver colored light with 12 pcs of-LED solar lights is a great alternative to electric lighting, which has periodic bills. The LED bulb does not require replacement, making you save on replacement costs. The light is environmental friendly in all aspects, with its durable stainless steel kind of design. 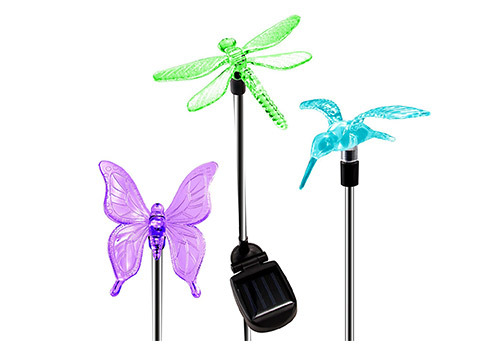 Beautiful light, with a variety of designs including butterfly and dragon stake lights, multi colored-changing LED lights, outdoor decorative, hummingbird and many more. Your outdoor quarters including the front/backyard, garden and lawn will look like a shining butterfly/birds party at night. The built-in solar-panels recharges automatically during day-time and lights will automatically turn on at darkness. The solar panels will go for a full 8 hours when they are fully charged. The well designed light is made of high quality material, lightweight, durable and waterproof. 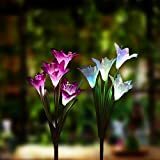 This is a high quality solar light for your outdoors, with a beautiful lily design, made of high quality material, lightweight and very durable. The waterproof functionality is classed at IP65. 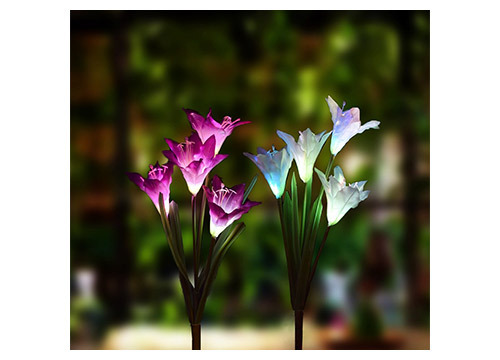 The lily-shaped light comes with a 7 color changing resolution. 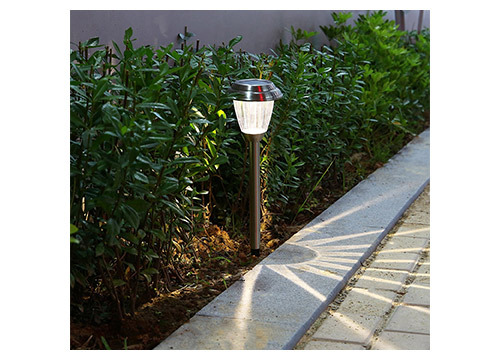 It is ideal as a path light, an in-ground light for flowers, trees, fence, garden and walkway. The light requires no external electricity or any kind of wiring. It is automatic after darkness and will turn itself on to lighten you pathway and garden. The lighting can go up to a height of 67cm. Solar lights provide you with a great way of outdoor lighting, at the same time saving on energy costs and lessening environmental carbon issues. 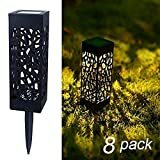 There are so many varieties of solar garden lights, which come with various classy styles and designs for your outdoor garden. The above guide will take you a long way to making the right decision. For further details, you can use the given links.